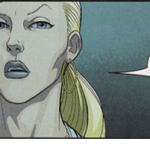 Kieron Gillen notes that it's in-character for Emma Frost to have a revealing wardrobe. Has Emma taken a backseat since Utopia? According to Kieron Gillen, no. She is still second-in-command next to Cyclops, even though he agrees her position of power is dependent on him. "Uncanny X-Men" #534.1 starts Kieron Gillen's new X-adventure. Uncanny X-Men #533 stocks the shelves February 23, 2011!